It has been developed and tested on Ubuntu, but as it only relies on Perl-Gtk2 libraries, it can be run on any Debian-like system. It is a graphical tool to allow easy configuration of init services in user and system runlevels, as far as changing start/stop services priority. Install it using the following command. It is found in the official repository of Ubuntu, so you don’t have to add any external repositories. 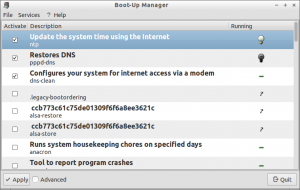 Open up Boot-Up Manager from your Dash or Menu. The default interface of BUM will look like below. Just right click on any service that you don’t want to run at every reboot and click on “Deactivate & apply now” button. 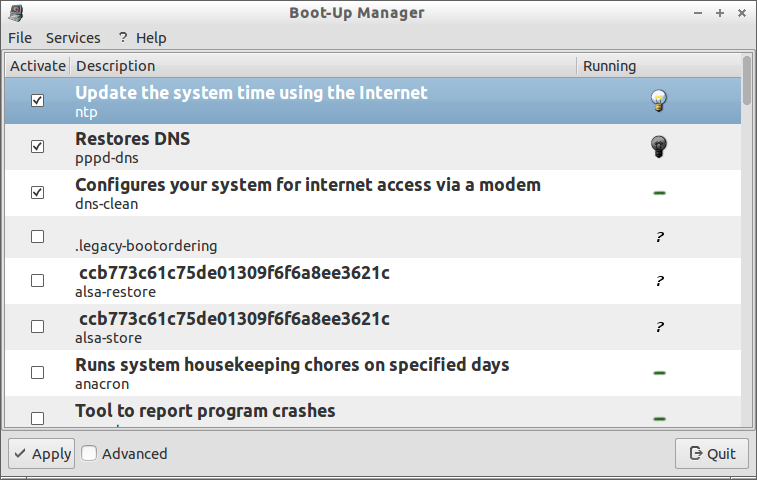 The running service will be stopped at the next boot time. To start a stopped service, right click on the respective service and click on “Activate & apply now”. Also it has a Advanced configuration window that can be used to manage start-up services at specific runlevels. To open the Advanced configuration, just click on the Advanced button on bottom side of main screen. It gives us the option to setup the start-up and shutdown priority to the services. We can increase or decrease the priority of services. Overall this tool can be used for newbies one who are not familiar with command line options. For information about BUM, refer the official documentation page.